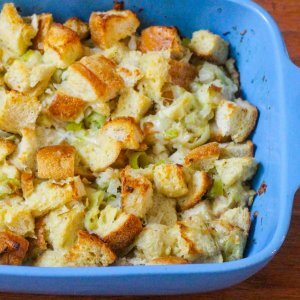 This crispy and delicious cheesy sourdough stuffing/dressing is full of parmesan, garlic, leeks, and shallots. The perfect Thanksgiving side dish! Place the cubed sourdough bread on a baking sheet in a single layer. Bake in the oven for 15 minutes until the bread gets crispy. Remove from the oven and set aside to cool until ready to use. Once you're ready to cook, your veggies are cut, and your leeks are cleaned, heat a large skillet over medium heat. Add the butter and olive oil until the butter is melted, and then add the leeks and shallots to the skillet. Season with salt and pepper, and cook, stirring occasionally for about 7 minutes. Add the garlic, stir, and let cook one more minute. Remove the skillet from the heat. In a separate, large mixing bowl, whisk together the eggs, parmesan cheese, 2 cups stock, and a pinch of salt and pepper. Once combined, add the leek mixture and toasted bread and stir. Depending on how much bread you have, you may need to add a little more stock until the bread is moist. Transfer everything to a large baking dish (about 12 x 8) and cover with aluminum foil. Bake the stuffing for 30 minutes, remove the foil, and continue baking for another 30 minutes (1 hr. total). Remove from the oven and serve immediately or keep in the warming drawer until ready to serve.